30 day advance registration qualifies for a $75.00 discount. Mediators meet with people in conflict and help them develop a mutually acceptable settlement. Individuals and organizations throughout the world have found mediation to be a secure, flexible, and constructive means of resolving conflict. This seminar presents a step-by-step approach to the mediation process and emphasizes the concepts, strategies, and skills effective in resolving conflicts. 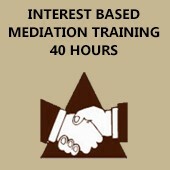 The program includes several simulated mediation exercises on employee, neighbor, customer/business, landlord/tenant, and environmental conflict so you can practice the skills learned in the program with the support of our coaches, who are experienced mediators. What you will learn: Analyzing the causes of conflict and learning strategies to de-escalate conflict. Structuring mediation sessions for success. Negotiating strategies that lead to joint problem solving. Communicating effectively as a mediator. Handling strong emotions. Exercising power effectively. Responding to ethical dilemmas in mediation. Would you like to develop your mediation skills? This introductory seminar is for people from all professional backgrounds. Public and private sector managers improve their conflict management abilities. Attorneys gain new skills to serve their clients. Therapists, counselors, human resource professionals, health care providers, religious leaders, educators, and consultants complement their other professional skills to incorporate mediation into their professions & services. IMA Approved Idaho State Bar and Washington State Bar - CLE credits Meets the requirement for basic mediation as needed for WMA Mediator Certification. The Fulcrum Institute Dispute Resolution Clinic reserves the right to cancel a training based on enrollment.